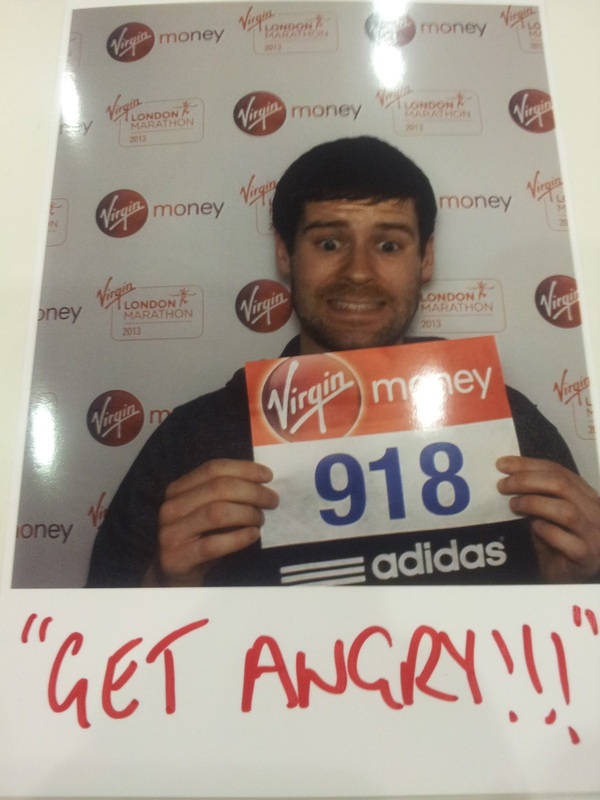 Jamie On The Run: Geein it Laldy in London! Geein it Laldy in London! The blue skies, blazing sun and purring of helicopters all heightened the sense of anticipation. As I walked up Vanbrugh Hill, the blimps came into view along with thousands of men and women descending on the grassy surrounds of Blackheath and Greenwich Park for the 2013 London Marathon. If ever I have had a date with destiny, this was it. I can remember watching ‘the marathon’ on TV when I was younger but I must admit at that point taking part didn't ever cross my mind – I just I enjoyed watching any sport. Years later when I first moved to London I remember hearing the crowds from my flat near Tower Bridge and I walked down to see what all the fuss was about. 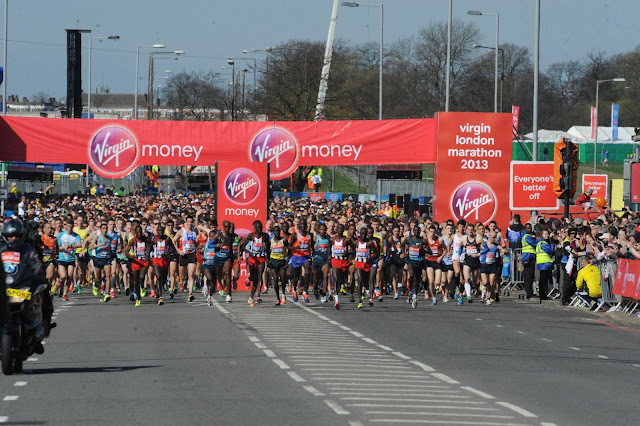 I had recently started doing a bit of running and it was at this point that I thought to myself why I am not running in this amazing event right on my doorstep. I couldn't even watch much more as I wanted to be involved so much. 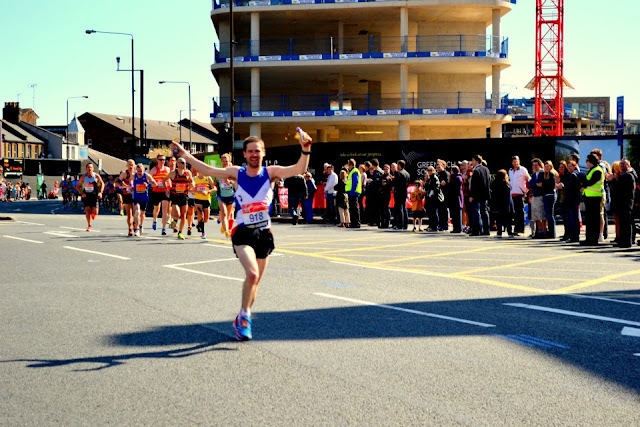 How fitting that when I did finally get to take part in my first London Marathon I was living in Greenwich, only a short walk to the start in Blackheath, where I did most of my training runs. In the weeks building up to the race it seemed like I was trying to worry about as many things as possible, most of which were out of my control. After recovering from a cold/virus I started to focus my anxiety on the weather. Quite irrationally I had been concerned for weeks about what mother nature would throw at us. My fear being that after months of training in the cold, wind, rain and snow we were going to be subjected to a badly timed heat wave. With a couple of weeks to go this was certainly what weather forecasters were predicting. Never again will I look at a weather forecast more than a few days in advance! When the day came there was sun and blue skies but the temperature was about 10 degrees cooler than I had been expecting! On judgement day I got out of bed at 6am and forced my breakfast down me. While I am fairly used to getting up early and eating for races, it doesn't get any more pleasant with experience. I had my usual high calorie, high carb combination including cereal, a bagel and an energy bar. At about 8.30am I said goodbye to Sarah and made my way to Blackheath. 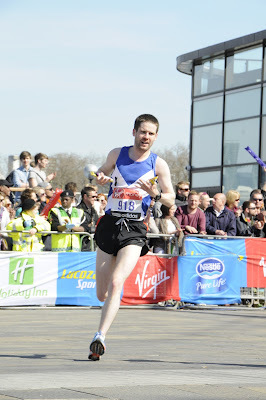 Although I was conveniently close to the start and could walk all the way, it did involve a big hill which wasn't ideal. The sun was shining brightly but it was feeling nice and cool. When I got to the top of that hill the place was buzzing just as I expected. 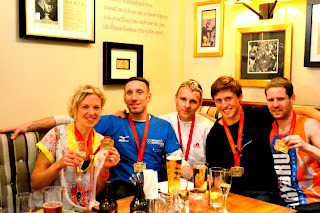 I negotiated my way to the ‘Championship Start’ which I had earned from my sub 2:45 marathon time in Pisa in December. The main benefit of our fenced off area seemed to be the surplus of portaloos. I bumped into Darren Tanner and his pal David Palmer, and later Clapham Chaser James Ellis. Having the guys to talk to made me a bit more relaxed. However, I still felt like I had the weight of the world on my shoulders and just wanted to get started. After handing in our bags we were able to have a quick warm up along Shooter’s Hill Road but I didn't want to expend too much energy with 26.2 miles still to negotiate. We got into our starting pen at about 9.45 and eagerly awaited instructions. Being as short as I am I could only really see the people directly in front of me so didn't get a glimpse of Mo sadly! Of course before the race start there was a poignant 30 second silence to remember the tragic events in Boston only a few days before. The tension was becoming unbearable. The gun went at 10:00 and we were finally on our way to Buckingham Palace (via Cutty Sark, One Canada Square, Tower Bridge, St. Pauls Cathedral, the London Eye and Big Ben!). Fortunately for me, it only took a few seconds to cross the start line but it was very congested for the first mile or so. I had to do a bit of weaving and it was frustrating when it seemed like there was just nowhere to go at times. Eventually I managed to make a bit of space for myself and tried to start getting into a rhythm. I was trying my best to stick to around 6 minute miles. Later in the race I would be surprised at how long I was able to maintain this. I’d only run at this pace for the last 10 miles of a couple of training runs so anything after that was to some extent an unknown quantity. 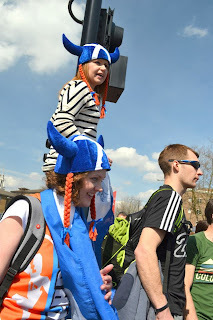 The first few miles of the race took us through Woolwich and Charlton, not exactly cultural and scenic highlights but what they did offer was incredible support. I settled into a good rhythm and my Garmin confirmed this with fairly even mile splits of around 6 minutes as planned. I tried to hold back going any faster than this to avoid the disaster of blowing up later in the race. I began to recognise the familiar streets of East Greenwich so knew I would likely soon see Sarah, Leanne, Christa and Adam who were staked on the road opposite my house along with my house-mates on the other side. Leanne had amazingly made a surprise trip down from Scotland which was much appreciated. I actually picked them out from some distance as I spotted the big Saltire on the railings – always a welcome sight. 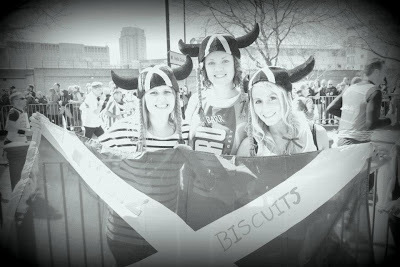 The girls were also wearing some comedy Scottish hats so I really couldn't miss them! 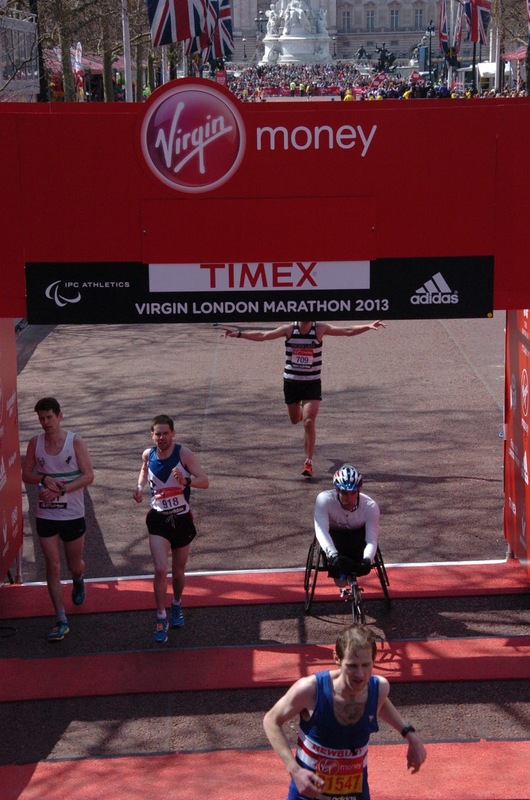 It was a great moment which really raised the adrenalin; in fact I had to slow myself down afterwards! The following photos of courtesy of the support team. 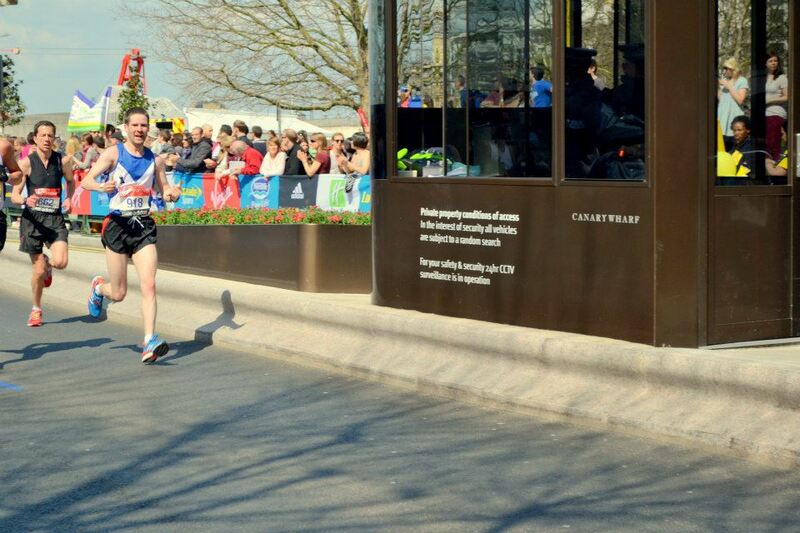 Lynsey enjoying her 10th Marathon! 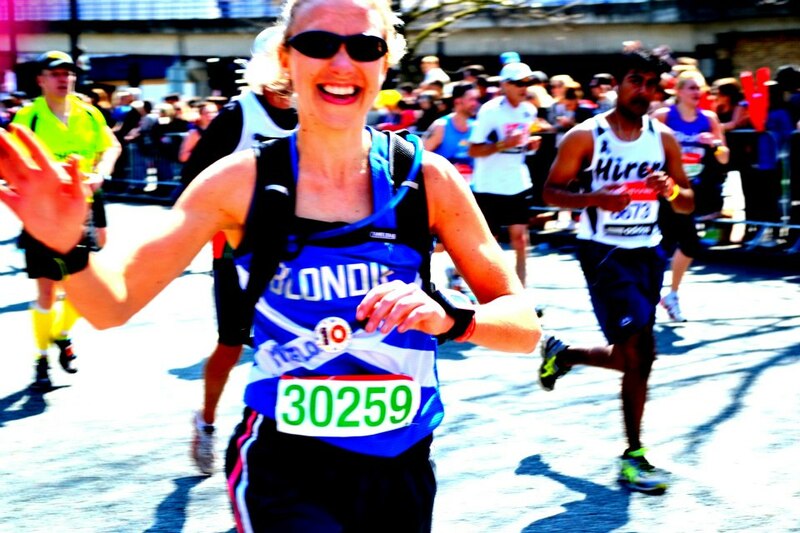 Maj storms down Trafalgar Road, making marathons look easy! Darren Tanner spots his fan club! 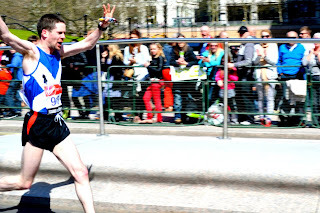 Not long after this excitement and on the same road I had a shout from my friend John who lives in Greenwich. Then I got a shout from London 2012 colleague Mark so it was a great run of support! 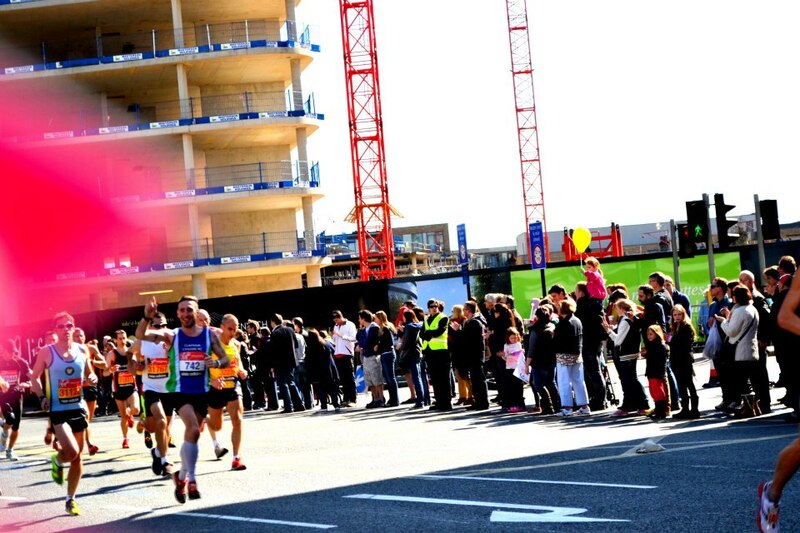 Not only that, I was approaching the famous Cutty Sark where runners can always rely on a rousing reception. It didn't disappoint and it felt like we were running through one big party! Greenwich was also a psychological milestone having past the 10K mark. One of the moments that I’d really been looking forward to was crossing Tower Bridge, arguably the most iconic part of the course. As we approached it felt like we were entering a tunnel of noise with thousands of spectators on both sides. I was surprised to see both Ben and Lynsey’s dad John on the right side and Ben shouted my name while John took a photo. The volume was deafening and you really felt like you were part of something special. 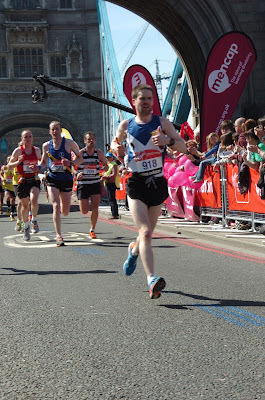 Halfway was shortly after Tower Bridge which I went through in 1:18:40, which was almost perfect pacing for 6 minute miles. It was feeling difficult but the miles seem to be going quickly – well relatively quickly! There was just so much to see and listen to that it took my mind of the magnitude of the job remaining. In the build up to the race it was suggested to me a couple of times that there were some quiet sections on the course including Docklands. I waited for a quiet part but it never came. I am not surprised at all that they reckon it was a record year for volume of supporters as the noise was just completely constant. We were then greeted by the skyscrapers of Canary Wharf where I do a lot of short runs at lunchtime. This was another busy part of the course and there was plenty of noise and encouragement. Not only that, I saw the support team of Sarah, Leanne, Christa and Adam again here as well as Mark from work branding a saltire. There were also a couple of former colleagues who gave me a shout but such was the noise I didn't know until they told me after the race. At points the noise was unbearable! At about mile 22 I started to get worried. I was slowing a little which I expected to happen but then alarmingly I started feeling slight twinges of cramp in my legs. This wasn't good news with 4 miles to go. I was still managing to keep up a decent pace but was consciously reigning myself in a little in order to keep the cramp in tow. This strategy seemed to work as the cramp stayed at the twinge level and didn't become debilitating. It did prey on my mind for the rest of the race though. Another highlight of the route was Blackfriars underpass. Normally this would be a dark, cold and lonely part of the course with no spectators but Lucozade and the organisers had filled the tunnel with large balloons with motivational slogans plastered on them such as “dig deep” and “you can do it” along with big amps blasting out the noise of cheering spectators. And then on exit of the tunnel there was an eruption of noise as we entered the famous Embankment. The noise was similar to that of Tower Bridge but as this point of the race your senses are altered and it can be quite disconcerting. I wasn't expecting to see anyone along the embankment but to my surprise and joy my friends Stewart and Amanda were furiously waving and shouting at me. This was a fantastic boost in the closing stages when I really needed it. Then I saw Big Ben and knew I’d entered the “death zone”. When I saw the 800m to go sign I knew this would be the most painful 800m of my life. It was only twice round an athletics track but my legs were beaten up and my body was telling me it had had enough. Then again when you only have 800m to go you know you’re going to finish and you just have to keep putting one leg in front of another. 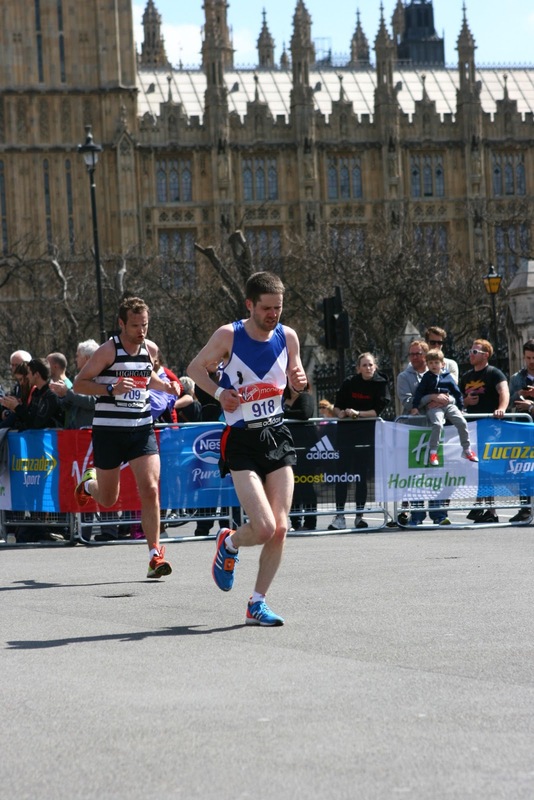 400m to go came slowly but I knew I just has to give it everything I had left. Finally crossing the line was simply relief, as was the time I saw on the clock. There wasn't the same celebration as in Pisa as I just didn't have the energy. I was physically and emotionally drained and had left everything on the streets of London. I staggered along a few steps and was ushered into a photo booth area to have my finish photo taken. 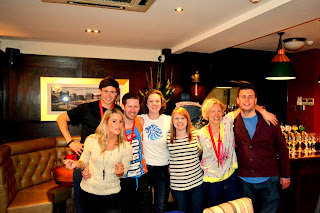 Then I made up my recovery drink, phoned my my mum and Sarah and started walking towards the Crisis post race event. I was greeted by friendly faces and treated to a massage and some reflexology. 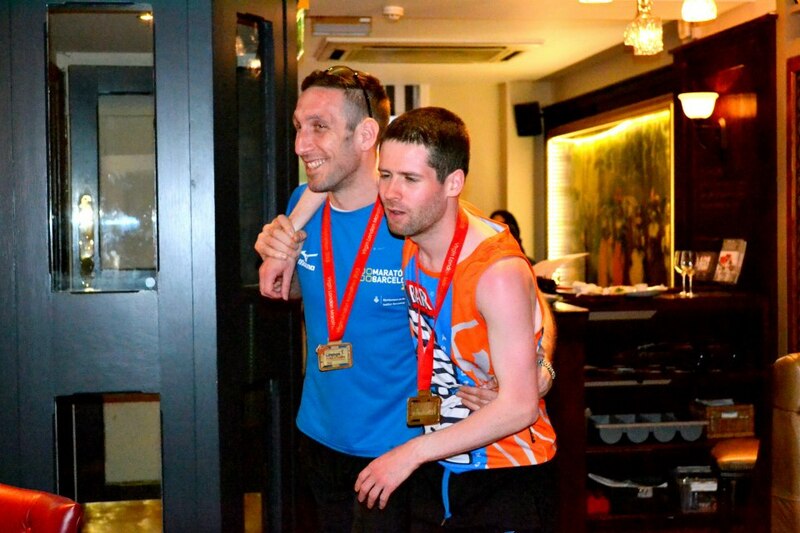 A donation on the day took me past the £1000 mark which was very special. I was taken aback by the number of donations I received for such a great cause and I am sure I will join the Crisis team again. Celebrations continued the pub where I was delighted to hear how the rest of the team got on. For me the performance of the day was by Maj who finished in a remarkable 2:44:47 , earning himself a Championship place for next year. Dave, was fastest with an unbelievable 2:33. Darren Tanner did admirably to finish in 2:47 despite his injury issues. 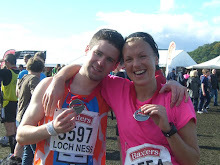 And Lynsey completed her 10th, yes 10th marathon in under 4 hours (3:58)! 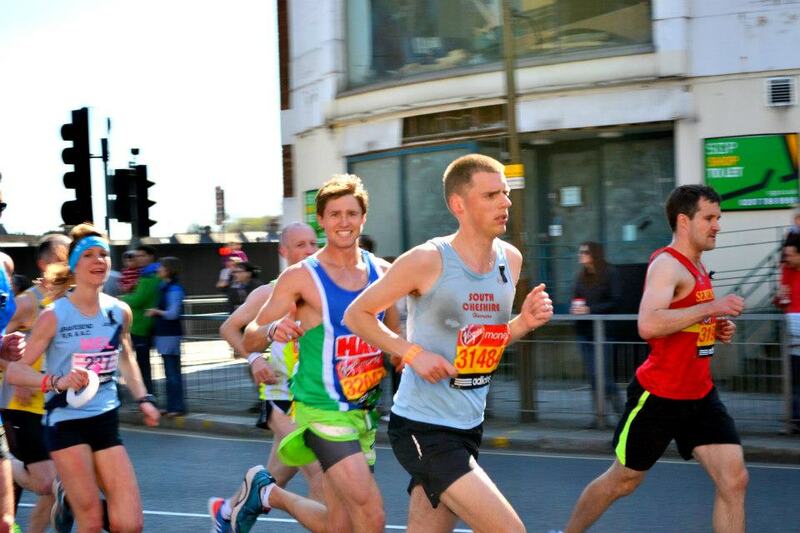 I still have a lot of work to do to get as fast as Dave and Darren whose PB is 2:35. 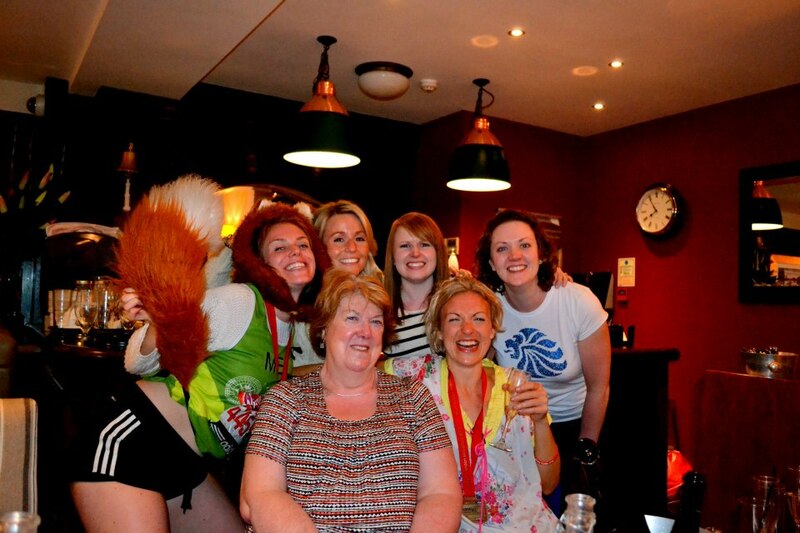 The photos below are from the pub where the Prosecco and beer flowed and a slap up meal was enjoyed by all. The question I've been asked most since the marathon is what I'm going to do next. It’s still a bit early to make any decisions but I am pretty sure I won’t be doing another marathon this year and may not even do London again next year. I am keen to take a break from the marathon distance and focus on increasing my speed in shorter distances such as 5K and 10K. 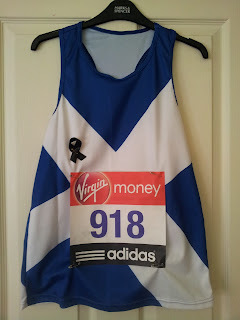 Once I feel I've got my speed up enough I’ll have another crack at the marathon. After all, I have now done 2 in the space of 4 months so an autumn marathon and London next year would take me to 4 in 12 months which I think is just too much for my body to be running consistently good performances. So it looks like an exciting summer of racing is ahead. 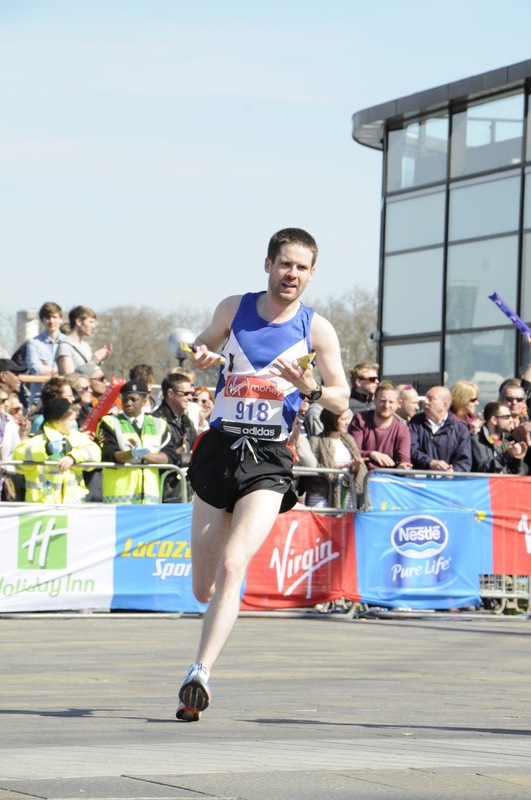 The thing I like about that most is that I can run multiple races in a short space of time so feel under less pressure than the marathon where everything is down to one day. The marathon is a cruel mistress and so much can go wrong in the week before or on the day. So far my marathon times have improved each time and I don’t want that to change. That leaves me to thank everyone who supported me once again, from following my training progress on facebook and the blog, to sponsoring me and supporting me on the day. 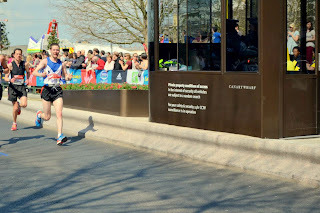 I know a lot of people were also using the marathon tracker on the website which made me keen to keep my split times up! Super report Jamie! - very interesting to read of the build up to the day - your emotions, the crowd support and the whole atmosphere of the event. What fantastic support from your friends and colleagues -especially team Sarah! Your photos are lovely to see and beautifully illustrate the day. It is a day we all enjoyed enormously and will never forget. 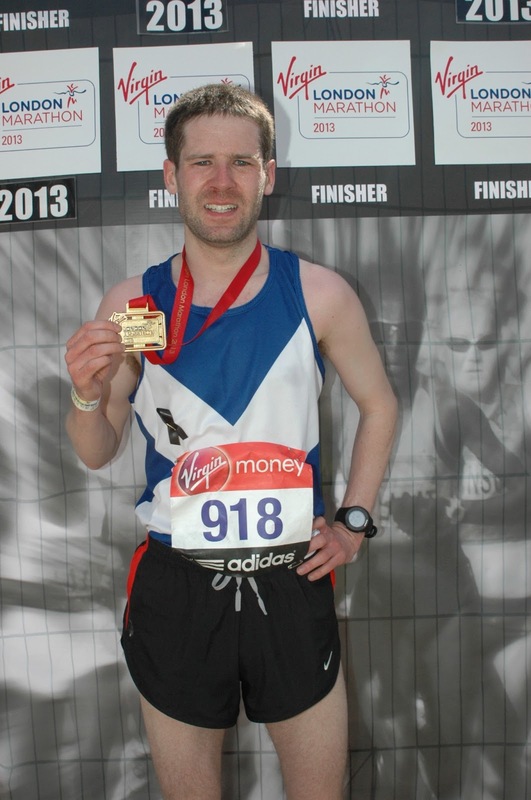 Well done on your achievement - PB and finishing position-154. Long may your lum reek and your leigs run! 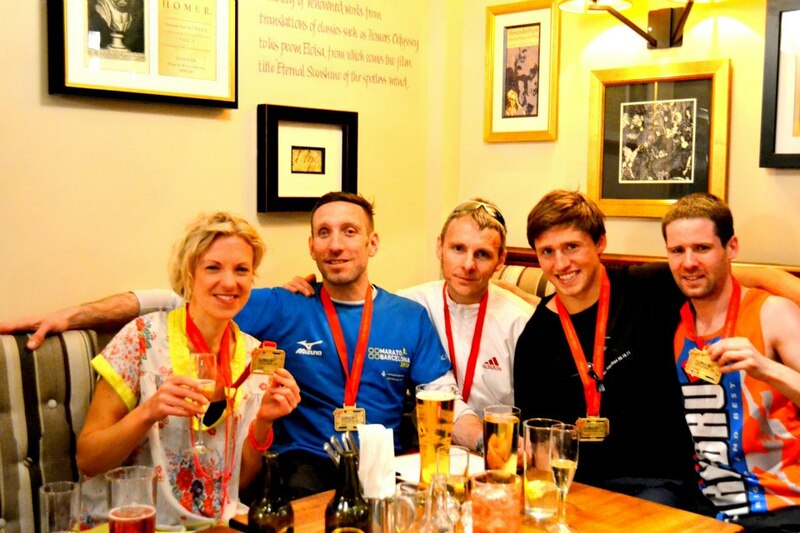 Good luck with your summer of races - now a member of Clapham Chasers.